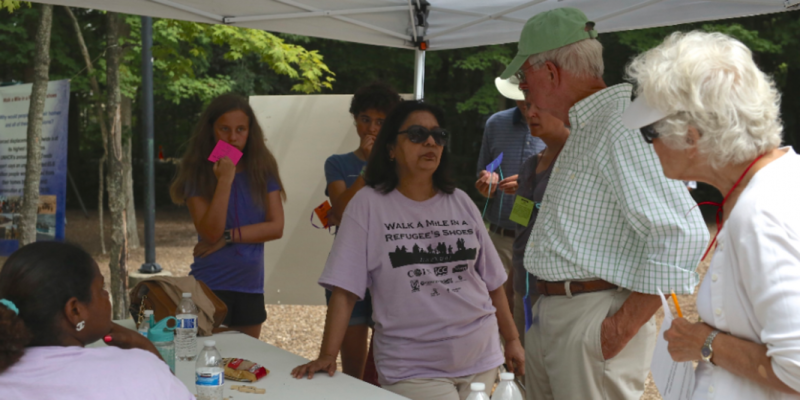 Washington DC – This summer communities around the USA have been rallying around refugees – holding events to raise awareness and funds for those who have been forced to flee their homes due to violence and persecution. St. Peter’s Parish – Charlotte, NC. At St. Peter’s Parish in Charlotte, NC, the church community’s youth wanted to do something about the refugees they had seen and heard so much about in the news. So, they decided to learn more and to raise awareness and funds for refugees. First, they set up a “Lemon AID” stand outside of the Charlotte church, sold lemonate, and told people about the plight of refugees and the work of Jesuit Refugee Service (JRS). More than 50 teenagers advocated for refugees and raised $101 to be sent to JRS. “The ‘Lemon AID’ stand is a concept derived from the water station in the ‘Walk a mile in my shoes’ tool kit JRS provides for communities to experience the life of refugees,” says Cathy Chiappetta, Faith Formation Director at St. Peter Catholic Church and organizer of the service week. The also held a ‘Any Refugee Postcards’ activity to fill out post cards to send to refugees as a gesture of hope and comfort. Through this activity the teens realize how important it is to be positive for others. While the project helped the teens to learn more about refugees, they were also able to teach others in the community by giving out materials to read. “It was nice to show other children about refugees and that there are problems in the world that we can’t necessarily solve, but we can help,” says Katharyn Fenzl, one of teenage participants. Teenagers, Chiappetta and Paul Fenzl were enthusiastic about the writing. “It felt good to write postcards that could be positive for refugees instead of just watching stories and talking about hard it is for them,” said Matthew. Coalition for Immigrant Neighbors (COIN) – Indianapolis, IN. Similar excitement was also shared among a community in Indianapolis organized by the Coalition for Immigrant Neighbors (COIN) – a non-profit that coordinates efforts of organizations working with and for immigrants and refugees to create efficiencies filling any gap in service). In July, to raise awareness in their community, in partnership with other faith-based and advovcacy organization, COIN organized a “Walk a Mile in My Shoes” simulation. The event was attended by 450 people from around the Indianapolis area. The participants went through the simulation that helped them to feel the frustration, disappointment, and hopes refugees around the world face. The participants started by going through the border entry point and moving along to the food, water, medical, and education stations COIN set up based on the JRS “Walk a Mile in My Shoes” Simulation tool kit. The event ended with advocacy awareness where participants received information about supporting refugees in Indianapolis. “My belief is if you meet a person or you walk in a person’s shoes, they are no longer a ‘refugee’ or an ‘immigrant’ they are a person. That is what we are trying to bring with this,” said Legal Clinic volunteer and COIN Executive Director, Julie Sommers Neuman. She believes that the event helped many who were not previously aware fully understand the plight faced by refugees.